Another practice puzzle. Apologies for the lazy presentation. Also don’t be disappointed if you don’t find a nice logical path. Rules Split the grid into regions of size 1 through 8. 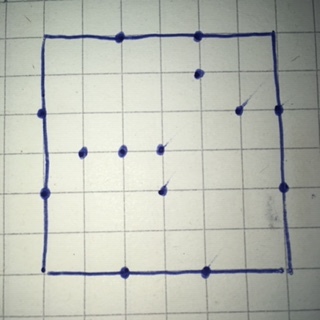 All vertices where three region borders meet are marked by dots. There are no vertices where four region borders meet. Or read the instruction booklet. This entry was posted in Puzzles and tagged dissection by vertices on 2018-11-15 by rob.